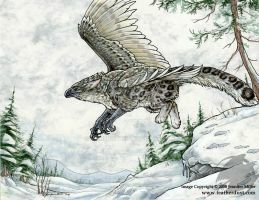 A gryphon pays homage to a tradition lost to the ages of time. 8" x 10" Freehand Ink and Watercolor. This will be at the FC art show next week! Love it! Love the posture, the story it implies...and of course the lovely watercolours. Feels like there should be a story involved. And you do this in freehand! You're awesome, Nambroth, I bet you know that! 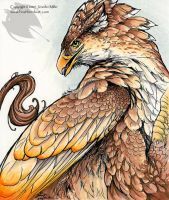 The body structure on this gryphon is just gorgeous. It has a real feeling of solid reality, like it could walk off the page into life. Very beautiful. You did a great job here expressing the mood of this picture. I bow to your awe-inspiring real media and illustration skills! Mine never turn out so well. I guess I still need lots more practice. I really love the technique you've used for the sky and moss, it really brings a lot to the painting. :3 The rocks are very well done and the gryphon looks spectacular. I really like the tattered flags as well. 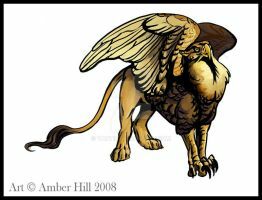 The Griffin, what a majestic creature. GAH all your watercolor pieces are amazing!! May I ask what kind you usually/mainly use? Right now I use Van Gogh brand, pan style. I only have 6 colors... I can't afford the really good kinds. (eep). Beautiful and solemn. Wonderful style. That's gorgeous! Very beautiful and a bit tragic. I love the line work and the choice of colors. I can't even fully express how much this wows me, it's beautiful. The feeling I get from this is full of pride and inspiration! It just floors me how you always pull such wonderful things off. As always, your freehand sketches amaze me. This is beautiful! And the texture of the sky is fantastic! that is just awesome! the texture is beautiful! as glorious as ever are your works! I really like the flags! I love the coloring-- it's got inner energy but it's not garish or heavy at all. I would love to see a stained glass version of this work! A great job! Hehe, they probably are short. I tend to do goofy mistakes like that when I freehand. Ah, the secret is out! Well, goofy or no it looks very nice. The red against blue makes this a really striking image. Beautifully done. I love all the textures you salted into the sky. Oh, this is really nice. I really like the texture that the water color brings to the picture. It looks very nice. Great work! 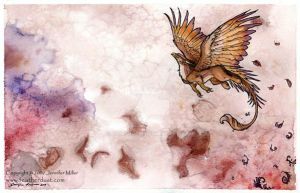 This piece seems to have a touch of sadness to it, and yet at the same time, the gryphon has an air of pride and honor as he continues a tradition long gone. I love the texture in the sky, and the overall layout and colors of the whole thing, especially the rustic red of the banners. In fact, I can almost see them waving. This is beautiful! I cant believe you have the patience for such tedious water color! I have been moving and just uncovered the boxes with the books, as soon as my mailers arrive they will be shipped. I apologize for the wait! This move put me in over my head in terms of time management. It is my fault. Its okay! I dont really mind the wait, I just wanted to make sure that it didnt get lost in the mail. Waow! did you use a tablet or scan it? Scanned! This is 100% real media.